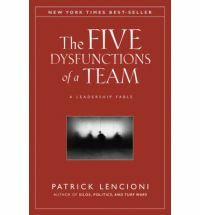 The FIVE Dysfunctions of a Team by Patrick Lencioni is unlike any other book on leadership or teams or management that I have read. It only has one chapter at the very end of the book which lists in some detail what the five dysfunctions of a team actually are. For the rest of the book, Lencioni tells us a leadership fable, a story about a dysfunctional team lead by a new CEO who helps them identify and deal with their dysfunction. I found this book both unique, interesting and excellent. The five dysfunctions of a team form a pyramid where by one of the dysfunctions leads to another, usually all stemming from a lack of trust. I think this is the genius of the book. You may be able to notice one or two of these problems in your team but as you see how the dysfunctions are related in the fable you start to see how the dysfunctions in your team may actually stem from another dysfunction you couldn't see before. At least that's what happened for me. I really think that this is a must have book for anyone in ministry as a large part of our work is making people work together in teams!